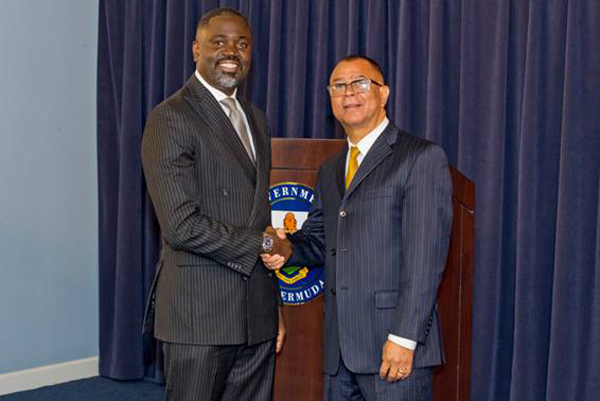 Pastor Leroy Bean has been appointed as the Gang Violence Reduction Coordinator, Minister of National Security Wayne Caines said today, adding that “Pastor Bean’s singular focus will be on implementing programmes to reduce gang violence and anti-social behavior. Minister Caines said, “All of us know the name of someone directly impacted by gun crime or some form of gang-related, anti-social or criminal action? Since 2009, the human cost of this kind of crime has been too great. Our society has been traumatized by the death and social upheaval created by the prevalence of what some have termed “the gang lifestyle”. “This government promised the people of Bermuda that we would “give reducing gang violence the priority it deserves”. Since July, I have been focused on that goal. Every morning at 9am I chair a meeting of the Ministry team engaged in the programmes around gang violence reduction and every day we focus on a portion of the strategy that can be better developed and isolate those areas that need greater attention. “In just 11 weeks the Ministry of National Security team has responded well to the challenge I issued when I was appointed. It was necessary to build on the work that had been done and in some cases sharpen the focus of existing programmes and resources to produce measurable outcomes. “This is just the beginning. As a team we have determined the core goals and objectives of our work in this area. We intend to measure ourselves by these goals and have committed to delivering on them for the people of Bermuda. 1. We aim to change the pattern of behavior of individuals involved in group and gang violence and reintegrate them back into mainstream society. 4. We must create opportunities of employment for young people and others who have previously been deemed “unemployable” because of their past. “The team I found in place was essentially a two-man operation, both of whom had devoted enormous time and talent to the task at hand. In keeping with the promise we made in our First 100 Days Platform, I have determined to strengthen that team and broaden the reach of our initiatives by engaging Pastor Leroy Bean as the promised Gang Violence Reduction Coordinator. “Pastor Bean has 14 years’ experience working with gangs in Bermuda and has been a Residential Care Officer within the former Department of Social Services. He holds degrees in family and addiction counselling and has committed himself to working within the communities affected by gang violence. Through his efforts many young men have chosen better paths for their lives and he will make an important addition to the Ministry’s team. “As we promised in the First 100 Days Platform, Pastor Bean’s singular focus will be on implementing programmes to reduce gang violence and anti-social behavior. He will be the lead in those areas designed to engage various aspects of the community including clergy and local employers, all with the goal of transitioning young men and women away from the gang lifestyle with viable social and economic alternatives. An ounce of prevention is better than a pound of cure. It is better to build strong men than to repair broken men. Good luck to you byes. If you are not going to provide the equal opportunity and remove barriers to entry that you so eloquently campaigned on your days will be numbered. One man, one vote – Jennifer smith for our next Hero. She made your position possible. Well look who popped out of the woodwork. I wonder if that appointment comes with a 21 year contract? Probably 21 years less a day. Well who did you expect, how many people do you know in Bermuda that has been directly interacting with young men who are involved in anti-social behavior for the last 20 years? Maybe you had in mind GQ Barron or de hippy looking guy that looked like de (PORTRAYED) image of Jesus. He might be the best person but he comes with a lot of baggage which could hinder his work if/when he comes into contact with the corporate world … seeking cash ..
Was he interacting with young men while writing his $160,000 report? Or did he take a week off to do that? What did he tell the PAC? Leroy Bean? Where have I heard that name before? He should ask DB if he knows anyone with guns so he can do an intervention. While you are doing lists can you provide a list of costs being racked up by the premier and his buddy. As you remember (I hope), you did promise transparency and we the people want to now what the expenses are. Also please call BIU and asked for those financials. Funny that phrase was absent from ubp supporters for de last 5 years. Don’t forget…so are the Gang leaders and Street Soldiers…Bermy so small…everybody is a friend or family…This guy ain’t gonna accomplish isht!…The best line of defense…Friends and Family. Well he’s good at milking the system. I’ll give him that. Well can you name someone please. @ OJ,How bout you BIGMOUTH!! Caines, what d heck?? This guy!!! Santa could accomplish more than this guy and that is proven. Do you know his history? all that money wasted…. YOU AINT GON DO….beeep. pastors already think “prayer” fixes stuff… you have to change the mentality of these youths.. which starts at HOME… there isnt anything this man can do thats gonna change anything. With all due respect Minister your comment is somewhat out of touch – Minister Caines said, “All of us know the name of someone directly impacted by gun crime or some form of gang-related, anti-social or criminal action. I can say our family and friends do not know anyone impacted by your comment. These guys chose to be in a gang and not work as the rest of the working class have to. They chose to sell drugs for profit. They them state “oh I can’t go Somerset/St. GEo/Town so I would ask you “would you employ them in your business”? Dare say you would!! Rev. BEan did nothing before and (other than a 21 year lease on White Island and then wanted to charge all for use of the Island). Can you not see the bushes for the Trees on this appointment or is this a FFP appointment yet again? Will they try and hand him White’s Island again? More dubious commissions? This make no sense…for this position you need someone who changed their life around or an ex DEA/Gang officer. A pastor? lol I grew up around Bermudas gang culture….good luck with that…. If you prevent violent crime ! Would that put lots of people out of a job? I have no way of defending my self or my family. We are the innocent by standers. Really tired of them using the excuse of economic empowerment. Stop making excuses for these individuals. How much is he getting paid for this I hope he is doing for free for the love of god. Make there parents accountable in some way because a lot of them are benefiting from gang life’s.